In this broader view, the belt (The three stars in the center) is seen in relation to nearby features in the Orion constellation. 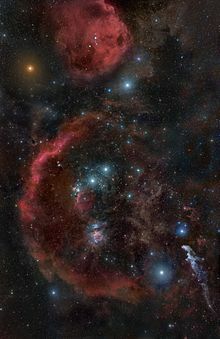 Orion's Belt or Belt of Orion is belt of 3 stars in one line in the constellation Orion. Ancient Arabic names of these 3 stars are Alnitak, Alnilam and Mintaka. These 3 stars are named by astronomers as ζ Ori (Alnitak), ε Ori (Alnilam), and δ Ori (Mintaka). These 3 stars are best visible in the night sky during the month of January. ↑ "APOD: 2009 February 10 - Orion s Belt". apod.nasa.gov. ↑ "APOD: 2003 February 7 - Orion on Film". apod.nasa.gov. This page was last changed on 13 February 2019, at 21:16.